Looking for a bite after a busy morning of inspections? 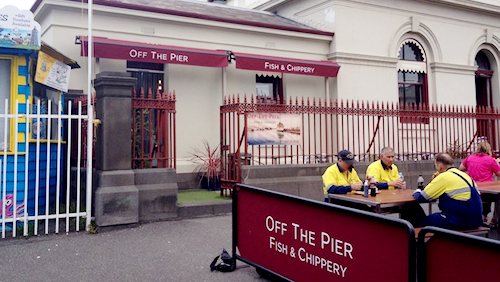 This week Street News writer Jessica Hoadley indulged in some good old fashioned fish and chips at Off the Pier in Williamstown. With its dazzling harbour views, bellowing ships’ horns and the smell of saltwater on the breeze, Williamstown is the perfect place to enjoy a box of fish and chips. The ferry tourists know it, the local businesses know it, and the seagulls certainly know it. 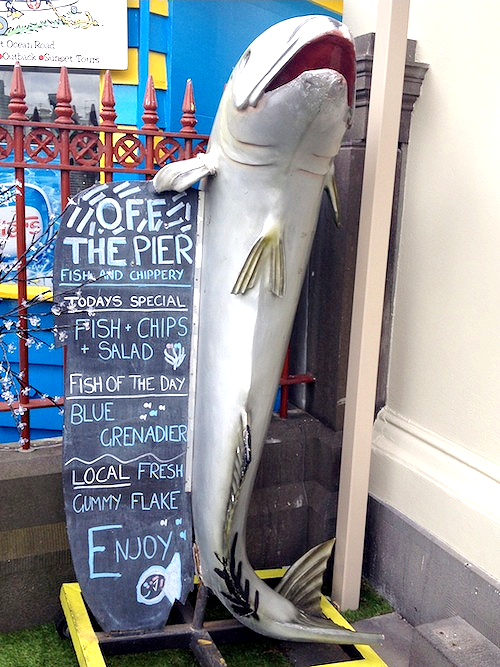 Situated within a chip’s throw of the historic Gem Pier (where the shuttle ferry to Melbourne docks) is self-proclaimed “best in town” fish and chippery Off the Pier. The shop is tucked in between the grand Customs Wharf Gallaria and a tourist seaplane booth, and the interior is so cosy there’s only standing room to order at the counter. 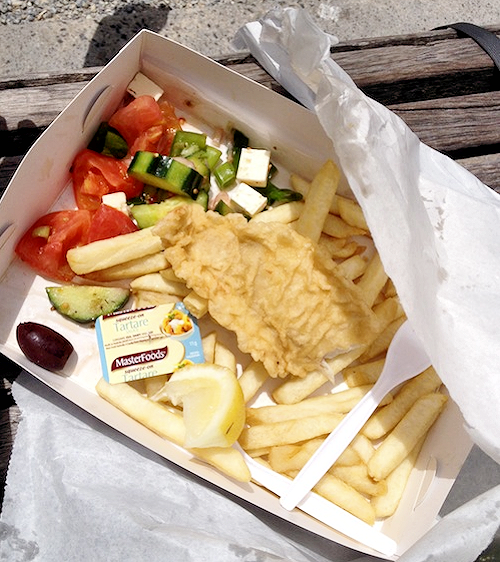 The menu is standard fish and chip fare, with the addition of South Melbourne-style dim sims and a fisherman’s basket that comes with a bit of everything (prawns, scallops, calamari, fish and chips). There’s stacks of seating both out the front on the street, and out the back in a huge sheltered courtyard gazebo. I sat out the back to wait for my order (flake, chips and salad) and then wandered across the street to picnic in the Commonwealth Reserve. The verdict? Salad: fairly flavourless Mediterranean salad with tomato, cucumber, feta and olives, but it was crunchy and refreshing. Chips: alas, no free tomato sauce in the box and I forgot to ask for some, but tasty nonetheless. Flake: finger-lickingly good. The batter was light and crispy and the fish cooked to perfection. It melted in my mouth. The seagulls were keen to get in on my lunch too. Not sure if they discern between the many different fish and chip shops on the strip, but they definitely rated my chips pretty high. Jessica Hoadley is a writer and editor based in Melbourne. She has completed a Bachelor of Arts (Creative Writing) and an Associate Degree of Professional Writing and Editing. She has been published in Voiceworks, Catalyst and Lip Mag.